Rainbowfish is made up of several genera of different fishes that form a large group of diverse aquatic community. They make excellent aquarium addition to your existing tank as they will adapt in well, living peacefully without harming your other pets like guppies, danios, rasboras or even small sized neon tetra. Most rainbowfish will not grow beyond 5 inches and they have attractive coloration which is how they got their name in the first place. Being an active swimmer that darts around the tank quite often, they have certain requirements in particular the water quality and the foods that they get. Quite a number of people have failed in their attempts to take care and make the fish survive in their tank while most of the reasons are generally related to lack of understanding on the fish’s behavior and needs. In fact, there are quite a number of confusion among hobbyist as to what the fish should look like and what their normal coloration is. Rainbowfish can be found in stunning yellow to turquoise or even dark neon greenish blue depending on the species. Normally, the colors can get pretty intense during breeding season when the males will show off their bright colors in order to get attention of the female fish. Thus one of the major factors that promote their healthy living is having a well-lit aquarium tank with lighting that provides full spectrum. Rainbow fish is extremely sensitive to changes in water hardness and a jump of pH can make them sick. If you notice that your pets suddenly stay idle at the bottom of the tank or gasping for air at the aquarium surface, you should take immediate action to address the problem. Avoid putting in the fish when the aquarium is at its initial setup stage as the water is not yet fully cycled and a good fishkeeping practice is to change the water regularly to ensure that the quality is top notch. As a guideline, the best water hardness should be in the range of 6 to 10 dGH while pH should be maintained at slightly acidic to alkaline level close to neutral zone of 6.8 to 7.2. 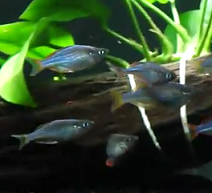 Let’s look at some of the most common rainbowfish which is highly popular among the aquarium trade. 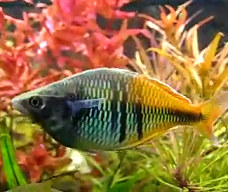 I would definitely recommend those in the list to be kept as pets for serious hobbyist looking to adopt and add one of the most colorful companions to their freshwater community collection. This species is easily recognized by its long trailing dorsal and ventral fins that sometimes extend longer than the end tailfin. 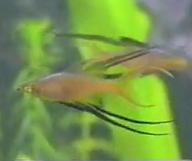 Unlike common rainbowfish, threadfin generally has thinner and shorter body length as it only reaches about 1 inch. Being small sized, they prefer to have a well covered heavily planted tank as it makes them feel more secure from the attention of other bigger fish. It is considered a larger species of the rainbowfish group of family. It can reach a full adult length of 4-5 inches and with this; it is also more hardy and tolerant of less than perfect water parameters. Madagascar rainbowfish will do well in a tank where it has companion of its own species with at least 3 or 4 of the fish living together. The species is characterized by the presence of a pair of vertical stripes/band appearing on each side of the body. One thing special about the Boesemani is that the orange/blue color mix can change and transform quickly to pale grey in a matter of minutes. With this, the color changes can actually be used as an indication on whether your pet is in full health or otherwise. During courtship of the female fish, the intensity will increase and grow brighter to display a spectacular array of colors. The neon dwarf rainbowfish is a curious and active community species. They generally would scatter and swim around the tank both at the middle and lower column of your aquarium but when they are frightened, they will start to group and school together. 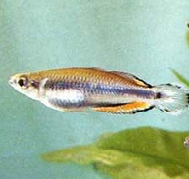 Being rather small sized that measure only up to 2 inches; they can be mixed with different kinds of fish such as cory cats and rummy nose tetra.